Carolina Epicurean visited our farm to learn everything they could about CBD Hemp. 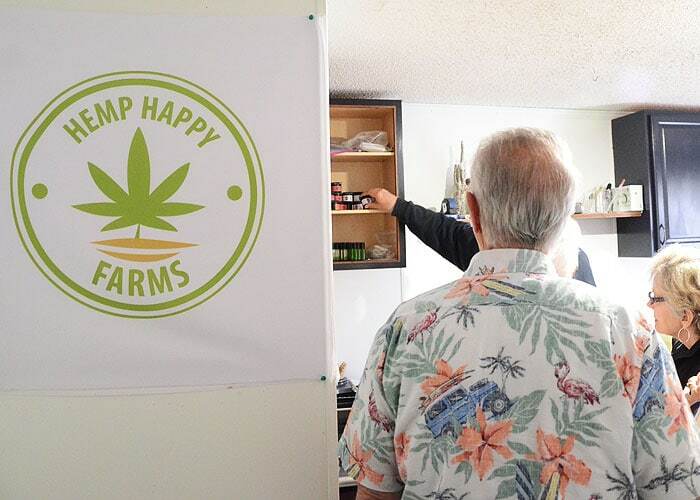 During their visit, they learned about the various ways to use CBD oils, how quickly each acts, pain relief duration, legality, permits, hemp flower insect and disease control, hydroponic gardening and more. We had a group of family and friends visiting from the NC Coast this past week and a few of them were looking for pain relief that had so far eluded them. They wanted to visit Hemp Happy Farms (https://www.hemphappyfarms.com/), which I hadn’t heard about, and was surprised to find that it’s right in my neck of the woods! Even after doing a fair amount of research on the whole hemp-helps-with-pain-relief thing, there was still some confusion. What’s CBD? Doesn’t it come from the same plant folks smoke to “feel no pain”? Wait. Now we’re talkin’ THC. CBD, extracted from the blooms of certain cannabis plants is what all the buzz is about. But not all CBD is the same and it can be used in a number of ways. “There are a variety of ways you can take hemp oil for pain management and each has its benefits. The serving size varies from method to method and person to person. Drops under the tongue are a fast way for the CBD to enter the bloodstream. You’ll feel the effect shortly thereafter. Edibles are foods that are baked with hemp oil in the ingredients, often brownies, cookies, or salad dressing. You won’t notice the effects for around an hour or so and even less on an empty stomach. Each beforehand and be patient. Capsules and gummies are another way to consume hemp oil if you’re adverse to the flavor. They take longer to break down and enter the bloodstream, so you won’t feel the effects as soon as you would with oil drops under the tongue, but eventually, they get absorbed. Topical creams with hemp oil are used to massage sore muscles and apply topically to areas with pain. The effects are felt immediately but don’t last as long as when you ingest the oil. We called first, just to be sure after seeing a couple different addresses. Turns out the location near me has the smallest grow-house. There are a couple of others, one of which is about four times as large as the one we toured. One of the co-owners of this family-owned-and-operated hemp flower farm heard we were outside and met us at the grow-house door. She raises hands in the air and says, “ahhhhhh”, this dude practically qualifies as an agricultural scientist! He was incredibly knowledgeable about all aspects of production. He showed us the many, many different types of cannabis plants they grow hydroponically, explaining the different CBD oil effects each produces. Other plant types were mixed in among the cannabis to help reduce insect and disease issues. They bring in ladybugs and praying mantis to also help control unwelcome insects. No pesticides are ever used. We did ask about legal issues, permits, and plants that might produce THC. He explained that they’re regulated by the NC Department of Agriculture. As soon as a flower bud appears, they have to notify the Dept of Ag. Then an inspector comes to the farm and tests all flowers to make sure there is no THC present. We learned about the various ways to use CBD oil, how quickly each acts, how long the pain relief lasts, etc. They are NOT telling customers what to use. They just describe what each product does and you make your own decision on what you think would work for your situation best. I first learned about CBD when a friend of mine had a horrific accident and couldn’t get acceptable pain relief with traditional medications. The only thing that worked for her was taking CBD capsules. I was about to pursue the same course of action when dealing with a herniated lumbar disk, but was finally prescribed a pain med by my neurologist that worked. To that point, nothing had touched the pain at all, except an ice back that numbed my back. That said, some of our visitors have ongoing pain at various levels and were looking for better/different ways to manage it. As of today, after using the Hemp Happy Farms CBD salve, they are experiencing pain relief and are very happy with the product.